Fragaria vesca, or alpine strawberry, has been a species of interest to me for the past several years. One reason is their delicious flavor. Another is the intoxicating aroma that you won’t find in regular garden strawberries. Their ever-bearing habit and tendency to clump and not spread by runners is also noteworthy. After testing numerous varieties, I’ve grown to prefer the yellow or white-fruited types. The past three seasons ‘White Soul’ and ‘Yellow Wonder’ have been particularly fruitful and of the highest quality for eating out of hand. The berry size is considerably larger than some of the red types. Whether or not the birds recognize the white and yellow fruits as being ripe is questionable, but an interesting idea nonetheless. Out of the red-fruited types ‘Migonette’, ‘Deesse de Vallees’, and ‘Red Wonder’ have proven to be productive and high in flavor. 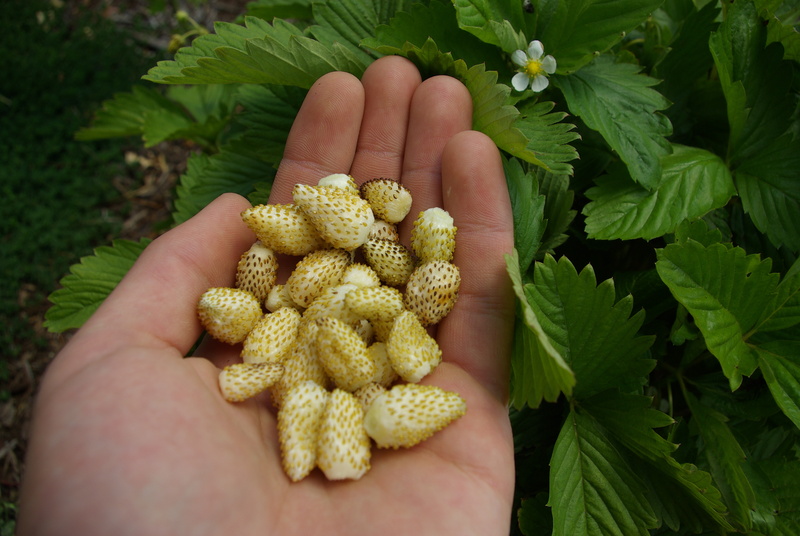 Although alpine strawberries may not be a substantial fruit crop, they are definitely worthy of cultivation on a home scale. They provide a continual snack from early summer through fall and are relished by children. Out of the many visitors to my garden I’ve yet to hear one negative review. Some have said they taste a pineapple flavor, or ‘the sweetness of honey.’ In the edible landscape they merit special attention as a plant for borders and in the understory of larger shrubs as they tolerate partial shade and still fruit well. I’ve expanded my plantings this year and incorporated new varieties like ‘Holiday’, ‘Pineapple Crush’, and ‘Ali Baba’ to name a few. To learn more and buy plants, visit www.thestrawberrystore.com.